Groundwork Basics that will help begin your horse’s education from the ground up. Firstly, keep in mind that groundwork training is ongoing, from the second you take your horse out of the stable, to when you return to the stable or you turn your horse out. 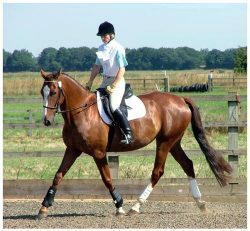 Initially, in the early stages and especially with a youngster, keep an old dressage whip or a similar length groundwork stick with you whenever you lead your horse. Whether your horse is in a halter or fully tacked up, use the whip or stick as a visual aid. Use it to lightly touch the part of your horse in the same manner that you would use your hand. NOTE: The whip or stick is never to be used as a punishment tool and never ever use it to strike your horse. Groundwork Training – A simple start. When you first start your groundwork training, do it in an arena, manege or round pen and let your horse become accustomed to working off the cues you give with the whip/stick or with your body. Begin by facing your horse and focus your attention on your horses shoulder. Hold your whip or stick horizontally in front of your horses face, level with his eyes but without making eye contact, and say, ‘ back ‘ in a normal voice as you walk forwards. Use your free hand to gently push against your horses chest until he gets the idea. Eventually, as you practice this, your horse will back up immediately when you turn the whip horizontally in front of its face. NOTE: Never allow your horse to make you back up. In the wild, an animal that backs up is submissive. If your horse enters your space and you back up, you’ve given ground and told your horse you are submissive. So, whenever possible and when it’s safe, do not back away from your horse. Always make your horse back away from you. Now teach your horse to walk obediently beside you. Holding your whip again horizontally across your horse’s chest, teach him to halt or slow when you touch him with it on the chest. If your horse normally rushes into his stable, this exercise will be the groundwork you’ll need to halt him at the door and make him wait until you are ready to walk him in. If he crowds you while leading him, push him off you with your hand to his shoulder and hold the whip out between you two. 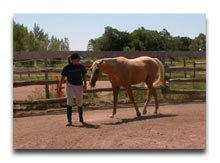 To teach him to move further away, you can stand in front of his front left leg, take a step toward him and use the whip to lightly touch his left side and have him move off to the right. Switch sides and have him move to the left by touching the whip to his right side as you take a step toward the right side. This type of groundwork training is great for getting your horse focused on you, before you ride or to end your schooling session while cooling him down after a ride. Practiced consistently, groundwork training can turn your horse from an ill-mannered bruiser crowding your space to an obedient, safe horse that is well schooled on the ground. Remember this; Your horse is learning every time you are and being a good horse trainer is about the quality of the training,.. not the quantity. Now in normal where to buy nolvadex tablets online range..